Everett was back in the studio this weekend for his 6 month sitter session as we work to document his first year with a Deluxe Baby Milestone package. He just gets cuter and cuter, which says a lot as he was so precious to begin with! It’s hard to believe that just 6 months ago he was laying on the moon prop as a newborn and his entire body was all curled up in the white vintage bowl! The gravity of how fast kids grow really hits home when you only see a baby every few months. Everett had more smiles for me this time around and I just loved his adorable baby belly and rolls. There is also something so precious about a little boy wearing a simple pair of denim jeans. 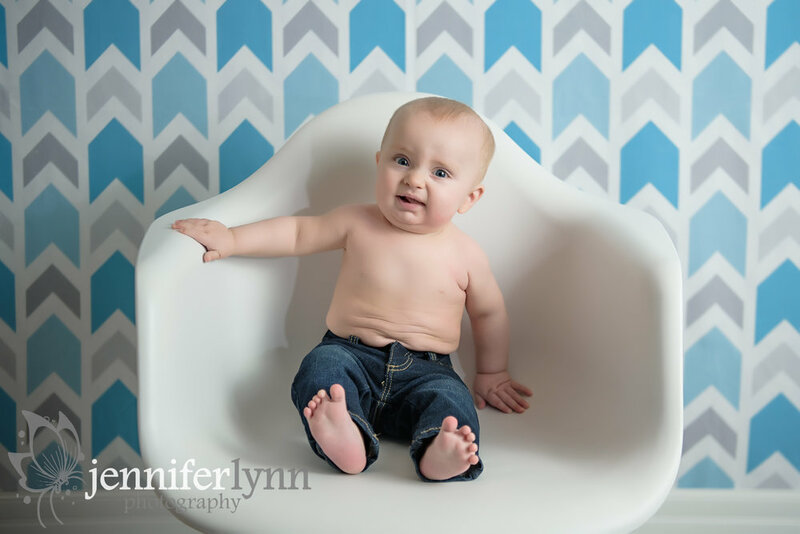 I look forward to having Everett come back in another few months for his 9 month session, and I anticipate he will be much more mobile and animated. It’s always a joy to photograph that fleeting baby’s first year.